Socca is a traditional dish from Nice, France. It is a flat bread browned or even blackened around the edges, and it has an almost custard like, tender texture inside. As with many traditional dishes, there are a dozen different ways you can make it – pan-frying, broiling, baking. It is pretty easy to make. All you need is equal parts chickpea flour and water, mixed with a tablespoon of olive oil and a pinch of salt. You can use more water to make a thinner crêpe-like socca or less water to make it thicker. You can also add some herbs and spices in the batter to jazz it up. Thanks to socca, I can have “pizza” which needs only a few ingredients and no brain. To me, it is too hard making GF pizza dough >.< It is totally gluten-free, perfect for GF pizza, wraps or flat bread. 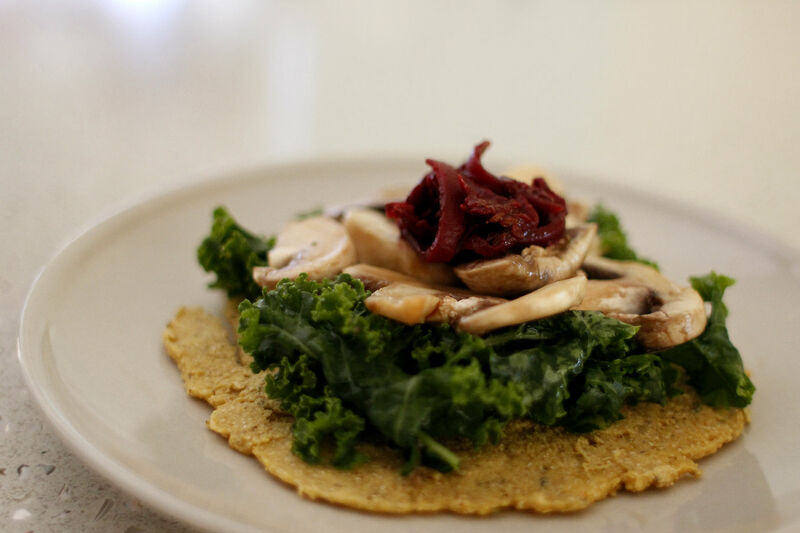 I made this socca pizza for my lunch today with some raw toppings to make it nice and fresh, but feel free to sauté the kale and mushrooms if you like. To make socca, mix all ingredients in a bowl, cover and put in the fridge for 30 minutes until the mixture is set. In the mean time, clean the kale and mushrooms. Tear the kale leaves into bite size and massage with salt and vinegar until softened. Marinate sliced mushrooms in coconut amino sauce. Take the socca mixture out of the fridge. Heat coconut oil in a non-stick frying pan and pour the mixture into a pan. Spread evenly with a spatula and cook for a couple of minutes each side over medium heat or until golden. Transfer to a serving plate and top with massaged kale and marinated mushrooms. I also added caramelised beetroot and onion on top.